Even though wood blinds have been treated and sealed, using water on them is still not a good idea. Avoid cleaning wood blinds with water or even a spray cleaner. All your wood blinds need is a little dusting. Use a feather duster, dusting mitt, or a clean rag. Simply run the rag or duster across each slat, starting from the lowest slat to the highest. This will help you avoid pushing the dust onto the already-cleaned slats below. If you want to take it one step further, you can always clean your wood blinds with a vacuum with a brush attachment. This will give you a deeper clean and it won't leave the dust you've pushed off the blinds on the floor or windowsill. Faux wood is more durable than real wood when it comes to using water. 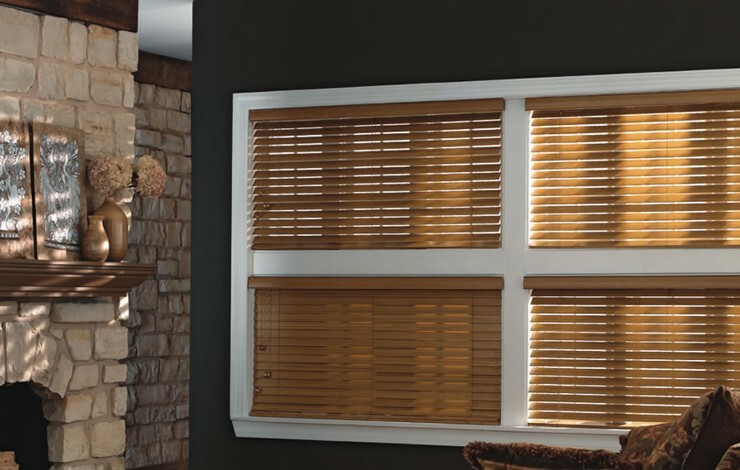 With faux wood blinds, you can use a warm, damp cloth to clean the individual slats. If you'd like to add a miniscule amount of soap or detergent to the mixture, you can do that, too. But never use an abrasive sponge or cleaning tool. This can scratch the faux wood and cause damage, eventually letting the water into the core of the slats. Just as with wood blinds, you can also use your vacuum's brush attachment to clean your faux wood blinds. Take it one slat at a time and you'll be done in no time. These are some of the most durable blinds out there and they're some of the easiest to clean. You can use both warm and cold water to clean them, and feel free to use soap. Because of the smooth finish of aluminum mini blinds, the dust should wipe off easily. However, if you need more cleaning power, you can take the aluminum blinds off the headrail and soak them in the bathtub. This is a sure-fire way to get your mini blinds sparkling again. However, as you're cleaning, try not to bend the slats. You'll want to avoid causing any damage to the blinds as you're cleaning them, no matter how minor it may seem at the time. Because fabric blinds aren't as firm as aluminum or even faux wood or wood blinds, they can be a little difficult to clean. First, try to clean them with the brush attachment on your vacuum. This may be all you need to get them clean. However, if that doesn't work as well as you had hoped, you can always take them to the dry cleaners. You won't need to do this every time you clean your fabric or cloth vertical blinds, but it's nice to know it's always an option. Cleaning your blinds doesn't have to be a hassle. With the right knowledge and tools, you can tackle an average cleaning day or more in-depth spring cleaning. What are some of the best ways that you've found to clean your blinds?